I’ve now been home from Ethiopia for almost three weeks. I went straight back into normal life. I shot a wedding with a case of jet lag. Then went on to edit the one I shot right before I left. I’ve had jobs to do just as if I’d never been gone. On top of that, I also had the pictures from Ethiopia to edit, and I’m just getting to some of the ones I shot in September as well. Needless to say, I’m tired. Which is why I have not written until now. It’s certainly not because I lack content. A lot happened on this trip, most of which I hope to write about once I figure out how to convey my thoughts properly. Though I don’t yet feel completely ready to start writing about the experiences I had on this trip, it’s been long enough, and I need to just start writing. The first thing I’d like to write about is something that happened the first day of the medical clinic. Medical clinics are always hard, particularly on the first day. That’s the day when the most desperate people show up; the ones who know something is seriously wrong but don’t have the money to go to a doctor. 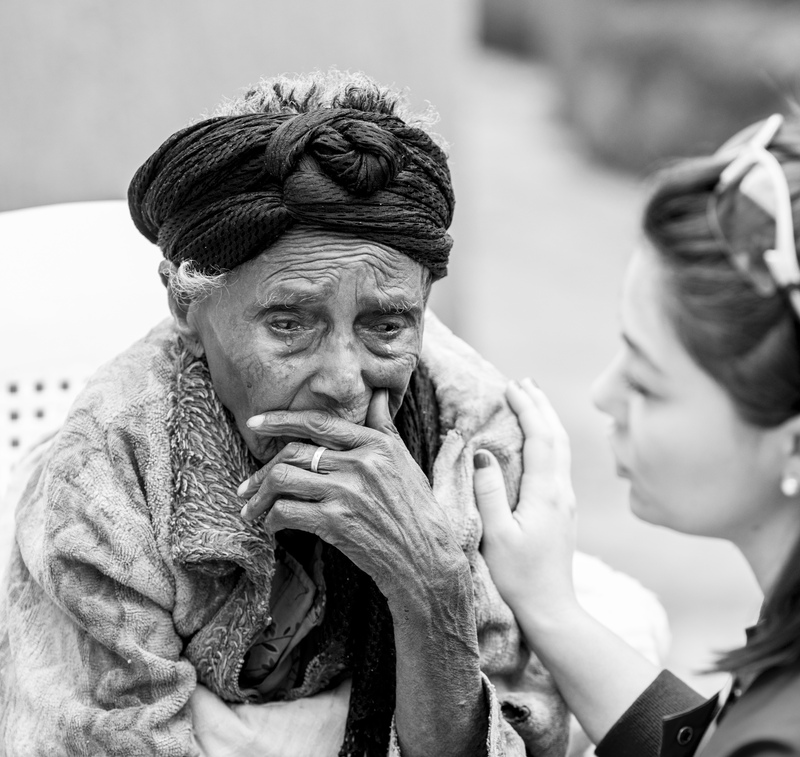 You see a lot of tuberculosis, a lot of cataracts, HIV, thyroid problems, even leprosy. But one lady just wrecked me. She was dropped off on a donkey by two men, who promptly left. She was elderly, bend over at a 90 degree angle, she was blind from cataracts, and she was extremely agitated. She said she was sixty years old, but if you told me she was ninety, I would not have thought twice about it by looking at her. Even before anyone was able to help her, she was saying if she didn’t get help she was going to kill herself. She said she had no home and no family, and had nowhere to turn. Looking through the lens gives me a little bit of separation from what’s happening in front of me. Even still, after I was done shooting what was going on in front of me, I had to go find a quiet corner and just cry. After that, I had to compose myself and get back to the tasks at hand. I saw this happening to other people as well. There are plenty of tragic human stories you see in Ethiopia, but the ones where you see no hope in people’s eyes are truly the ones that hurt. The woman got in to see the doctors, though I don’t think there’s really much they were able to do for her. We didn’t work on cataracts, and I don’t think there was anything they could do for her posture. We didn’t know who had dropped her off, so we also didn’t know what to do with her. Consequently she spent a lot of time in the medical clinic being tended by various people of different backgrounds that day, medical or not. I was also able to keep track of her since I saw so much of her. It was because of all of this time spent with her that her story began to crack. It turned out she was not alone. She had children, including a son, who had been watching from a distance. She also was not homeless, and apparently also had plenty of food, judging from the amount she kept pulling out of her blouse. (Yes, the story keeps getting stranger.) I heard people say (and honestly felt myself) that it had been foolish to feel such angst over this woman, because she lied to us. But should I have? I’d like first to say that dealing with the poor and the marginalized is often and usually messy. Sometimes they lie to you. Sometimes they have habits that cause them to be in the situation they are in. Frequently, it can take an emotional toll on you to the point where you begin to look for the emotional “out” if you will. It was for times like this that Paul wrote in Galations, “And let us not grow weary while doing good, for in due season we shall reap if we do not lose heart.” People were feeling foolish for having compassion because she had lied to us, but the fact was that her story was still tragic. She was still blind, still crippled. The desperation she had on her face when she arrived and the tears she shed were real. She lied because she wanted someone to show compassion to her and spend time with her, which is exactly what happened.